Nag Champa is a hand-rolled blend of flowers, spices, and resins. The natural ingredients, herbs, resins and masala are blended to perfection to create a soothing aroma. This aromatic incense with its sweet, yet earthy fragrance will enhance any mood or environment. 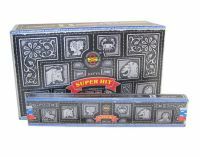 You will receive one box containing aproximately 15 incense sticks - the picture shown displays 12 boxes.